Hello there! Thanks for showing an interest ( let’s hope more than a slight one), and taking a look at the blog/diary of mine (Simon)and Megan’s overland trip to Australia. Hopefully it will become a seminal piece of work that will win literary awards throughout the English speaking world. In case it doesn’t then at least we will have a record of our trip and a member of the Maple family will finally be on the internet! We will be on the road for a year and travel through as many countries as we possibly can. Enjoy and feel free to drop us a line, it gets lonely on the road…..
Update Spring 2014 – Landy sold, looking for a new one to travel around Canada and the US in 2016.
this is awesome. mum will be excited. i mean im excited but well you know. Aha! I found you. Hope all is going well. Looks like you two are having a monumental adventure. As always, Captain Maple, watch your speed when you get in close. Hello from Oz, as a fellow brit living down under, i wish you all the luck on your epic trip, if you get to queensland, we should meet for a beer. Thanks for the encouragement! The wheel carrier had to be a bespoke version using two normal wheel carries welded together. No one makes one for a Hi Cap defender. Maybe there is a gap in the market, dragons den here I come. If you are interested I can take some more detailed photo’s for you. Thanks for getting back to me, just out of interest what was the cost for the wheel carriers. When do you start your trip???? are shipping the 130 back, or selling it here???? when you have done???? heres a pic of ours….in the desert…. At last they are off! Everything fitted in, Simon remembered the spare parts and Megan will be supplying South East Asia with toiletries for a year. Good luck have an amazing adventure and don’t forget to Skype. Thanks for your “Farewell ‘phone call” Megs. Bon Voyage to you both – Tons of Luck and Happy Landings wherever you go. All the very best Simon & Megan, from Brian on Oscar. Marlene and I will be following your epic journey all the way, and hope you both have a “safe passage” We enjoy reading about it all – so far – and look forward with interest to hearing all about your many adventures. ! Take care. I have had my laugh of the day reading about Day one! The photo looked the same as that taken the day before you left. You will soon relax and enjoy so take deep breaths and count to ten if you feel stressed. It is all part of the course!!!!! Much love and anticipation of further news soon. Hi Megs and Simon have just sat down for 2 minutes and read your diary and I have to admit it made me laugh. Hope the silicone has worked and that all is now dry. Annie and Michelle arrive tomorrow so best be back to work! How I long for a trip to Oz! morning simon&megan,well you are a week in now on your fantastic trip,i do hope you are both well,and you are enjoying your journey. I hope the landie is serving you well and not causing you too many problems. This is Michelle and Annie from the UAE. We have jsut set up your mom on Skype and need your Skype. Lots of Megan and Simons and lots of Simon Maples. Hope you have a great trip and we will be following your journey. Hi Megs and Simon thanks for the update guess you are on or near the beach- enjoy. Try and skype us on Sunday at 7 our time hopefully we will have the webcam and mike by then — however we can hear you if you don’t mind us writing! I will be following your journey Simon with great interest. Sounds a far better idea than rowing the Atlantic! go for it 🙂 Mapes guess a bit of green laning in Hampshire is out then 🙂 Buzz you soon, best of luck. We’re all following your trip in complete jealousy here on your old ship. Have a great trip. Just found this thanks to my daughter, Caroline. All sounds great and I will start following your adventure. All the best. Hope you are none the worse for your falling accident. I am eager to know if Megan was allowed to see the secret paintings at Pompeii? When Helen and I were there it was MEN only !!! Still want to know what we missed!!! Simon and Meg. Good luck with the journey – it was great to meet Simon before you left. The LRO feature on your 130 that we did that day comes out on Wednesday 08.09.10. Just read about your amazing adventure in LRO magazine… and cant wait to read more about your amazing adventure…. Good luck… and safe trip! Hi Simon, Megan… following your exploits with envy… enjoy yourselves and don’t forget to take it all in… Always here if you need any help. I have to say that I never realised how gifted Simon is in the literary sense. You really are very witty and I love reading the blog….its become a feature of my day! You have an ability to laugh at yourselves, which judging from the trip so far is just as well!! Keep it up and keep enjoying life. Hope the trip goes well for you both, really envious, good luck i will be following youre progress. Hope you are still having a good trip! You mentioned something about posting a spreadsheet with estimated expenses and costs on it, are you still going to do it? I have a dream to drive to Cape Town in South Africa from the top of Scotland. Not using a landy though, but a landcruiser! So, let me know how you guys get on! Good luck and I really do hope the old landy holds out for you! good luck on your trip! im so envious! have fun! The whole trip so far sounds great,keep posting the blogs we will be following your progress.Keep safe and have fun. Hi there. Just read LRO and saw your plans. I am very, very envious, and wish you all the best on your adventure. Please keep us all posted and enjoy Oz! Hi guys. 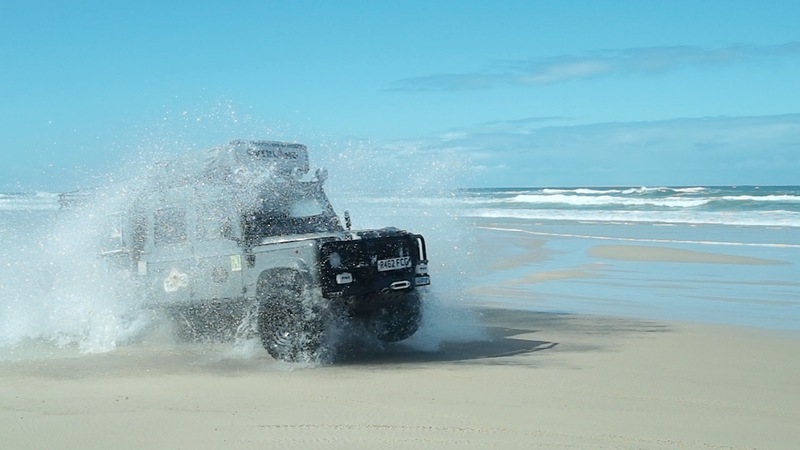 We have never met, but I saw your article in LRO – what a fantastic Landy and what a great trip! I drive a Discovery, but if I ever get chance to do ‘the trip’, a 130 has to be the vehicle of choice! Suffice to say, I will be watching your trip closely. Enjoy, and stay safe! Hi there. Just read the article in LRo about your adventure and I’m very jelous!! Good luck with your trip and hope all goes well. Keep posting the updates as it great for all us watchers to see how your getting on. Just to wish you guys all the very best. I am stuck behind a desk in the UK but dreaming about doing an Overland to Oz. Wife thinks I am joking…little does she know! Will watch with great interest over the coming weeks and wish you a safe journey. I have just read the article in LRO and I am full of admiration for you both. Good luck and have a safe trip. Been reading your bit in LRO. I’m green with envy. Hope everythings going well. Your blogs are very inspirational. Hope this is the case. Hope you are having a great time! It is so nice to see what you are up to and where you are. I have just returned from a short trip to India and if you ask me, you may pass it by. We have just moved into our new house and have got so much space around us. Something that you most probabley long for. At least you do stop at little hotels and have time to appreciate the luxurious facilities. You are in our thoughts and God Bless. So glad to hear that the adventure continues. Herbert says that the reason you are having problems is because you call the LANDROVER the car. Harriet is her name and she prefers to be called just that. (You have nothing to lose by trying it and you will make an old man very happy!!!! hi, are you going to Malaysia? There is a place call Black Hawk Workshop at Subang, Shah Alam, specialize for Land Rover. Can get servis or sparepart here too.. LROM are at the same place, so we can meet and share some experience. Hi, I have a Freelander V6, Land Rover. I would like to exchange my drive shafts both side. Would you recommend me a good work shop offers reasonable price. Miss you both (a bit), and envy you like hell! lots of love, and a man-hug for Si !!! (Ha ha!) Take care you two, and no Muslim jokes ! So glad you are on your way again. However you are still commiting the cardinal sin by referring to HARRIET as thec** (Cannot let myself write the forbidden word!!!!!!!! Please try harder to break the habit. Hey guys, we are brits living down under in tasmania, just wondered if you were planning to come down this way, if so it would be good to catch up as own a few landies myself and am a bit of a fanatic. all the best with the trip! Delighted to see that you’re heading to the Cameron Highlands … Land Rover heaven! Why? You will see when you get there. Best have your camera to hand as the loads they carry have to be seen to be believed. If any mechanical problems en route, that’s the place to head for; they will fix ANYTHING!!! Three things you need for the rainforest (should have said while you were sitting waiting for Harriet). 1. Salt – a sprinkle on a leech having breakfast on your ankle will see them drop off quick smart. 2. Savlon – or the Malaysian substitute. Great around the naughty bits to counteract prickly heat ‘down below’!!! It’s the humidity which causes the irritation, Savlon is the cure! 3. Tiger Balm – if mozzies love you as much as they love me, then this helps. However, if you can prevent bites with Deet spray, then so much the better. We wish you a very Happy Christmas and a good New Year. Hope you enjoy the festivitiies wherever you are. All the best for your travels. Enjoying reading the blog.Thinking of you at this time.MERRY CHRISTMAS to you both. MERRY CHRISTMAS AND A HAPPY NEW YEAR WHEREVER YOU ARE for Cpt. Simon and his ,,seaman,, Megan. Hey mate! Enjoy you adventorous trip! hit me up when you guys coming to Singapore! Cheers! The problem with the handbrake is caused by the earthing from engine to chassis coming loose and the current choosing the handbrake cable to close the sercuit when you start the engine, burning off the lining. We are in South America now with a Toyota, but will travel to Australia as soon as we can to get a Toyota troop carrier, and start a whole new worl adventure. I would never trust my life and soul to a Land Rover again. I can not know if you are already on their way to Australia or just going to leave? I too have a plan to ride my Defender 110 with Polish to Australia, so we can do it together. Waiting for the answer to my e-mail. Happy New Year Meg and Simon. You were both missed over the festive season but we were rather envious when reading of the sun and cocktails you were forced to endure!! Reading your news brightens our overcast days. Nice to meet you in Torquay, Victoria, Australia ( Not the Torquay in Britain) very impressed with your setup, enjoy the rest of your journey, drop me a line anytime if I can be of assistance. i see you are getting close to selling your vehicle. Are you in oz at the moment? We’re still following your progress on ‘4×4 Overland Forum’ – http://www.4x4overlandtravel.com – even if you have turned into “trailer trash”. Keep those photos coming, especially of the 130 in wierd and wonderful locations. Have fun kiddies! Thanks again for popping over and answering my myriad of questions, and providing inspiration. Was lovely to catch up with you both. Heopfully we’ll catch up again soon! I have followed your epic journey with great interest and as others have said your Blogg has been so entertaining. By the way the price of diesel has gone up to £1.40 per litre since you departed. Following your Oz journey with an increasing desire to down tools and jump on the next plane. My favourite place on earth is Jervis Bay National Park where I see you spent some time recently. I’ve camped there so many times over the years and recently with the family who love it just as much as I do. I was sunbathing on the beach at South West Rocks 21 years ago when I felt an earth quake which killed a couple of folk down the road in Newcastle. The weather in Ireland has been a wonderful 22 degrees with little or no wind since about last August which makes the decision to leave quite difficult!!!! You have met so many people on your trip the majority being fellow travellers. Have you had any meaningful conversations with real Aussies? The time is going so quickly now and we are so looking forward to seeing you both. Congrats on getting the job ,Meg and commiserations to Simon for his future loss of Harriet. Hey Connie, perhaps you could buy Harriet and go off on your own ’round the world venture? Now there’s an idea!!! So come on then Simon and Meg.. what next ! Hi guys, im currently in Bamaga at the tip of cape York and on a similar journey around Oz as what you did. On having a google I came across your site. Im looking at options for driving my truck back from Australia overland to the UK…… Is it possible?? We are planning to drive our car back to UK.